From my viewpoint on the edge of the eastern Sierra the distant mountains were invisible—hidden in a dense swirl of fog and cloud. I waited a while. For an instant I got what I was waiting for, a peak through the curtain at the Panamint Range and the distant basins and range of Death Valley. Exposure data: 300mm, 1/160 of a second at f/6.3 and ISO 320, hand held. I arrived early for a workshop I was leading in Bear Valley, the park headquarters for Point Reyes National Seashore. As soon as I parked my car I noticed a patch of grass covered with heavy dew. The sun had risen over the hills to the east, and even from where I was standing I could see gem-like patterns of light and reflections of the sun refracted through waterdrops thick in the grass. There was no point in using a tripod because there was a breeze and the grass was in motion. In any case, it would have been difficult to position a standard tripod as low to the ground as I needed to be to get really in-and-among the dew-bedecked grass. Without hesitation, I pulled out my camera and macro lens and got down on my belly in the grass. The sunlight and waterdrops seemed to create vast, radiant structures—ephemeral architecture made up of minute blades and moisture. I trolled forward on my belly. It was a gift just to get to witness this Lilliputian scenery. But my time was limited as I knew my students would be arriving soon—and the morning dew was quickly evaporating with the rising sun. I switched gears from observer to photographer. The photography trick was to expose for the sunlight, allowing the grass and background to fall into shadows. I knew I could “rescue” dark areas when I multi-RAW processed my files. Also, I had to be very aware of focus and depth-of-field issues since these are critical in macro photography. The idea was to take control of focus by being as parallel as possible to my compositions. I was shooting in the direction of the sun, meaning the grass was backlit. This lighting direction caused the most striking effects in the grass. I needed to understand focus and depth-of-field issues intuitively because with the sun directly ahead I could neither see very well through my viewfinder nor review the images on my LCD. As workshop participants started to arrive I switched gears again, and got up to setup for my workshop. I was dripping and cold from being down in the wet grass. Fortunately, I always carry a dry set of clothing with me—it wouldn’t have been fun to be soggy all day while I presented the workshop! By the way, if you are interested in my workshops you can keep track of them on the Photography with Harold Davis meetup group. Exposure data: All three images 105mm macro, ISO 200, hand held; Morning Dew (top) 1/1000 of a second and f/11; Splendour in the Grass (middle) 1/250 of a second and f/40; Dew in the Grass (bottom) 1/800 of a second and f/14. I suggest making your own list of things to be thankful for. Your list doesn’t have to be complete—and probably can’t be. Making this list will help you get through the holiday season with elan and aplomb; and besides, as the New York Times will tell you, it is good for your health! 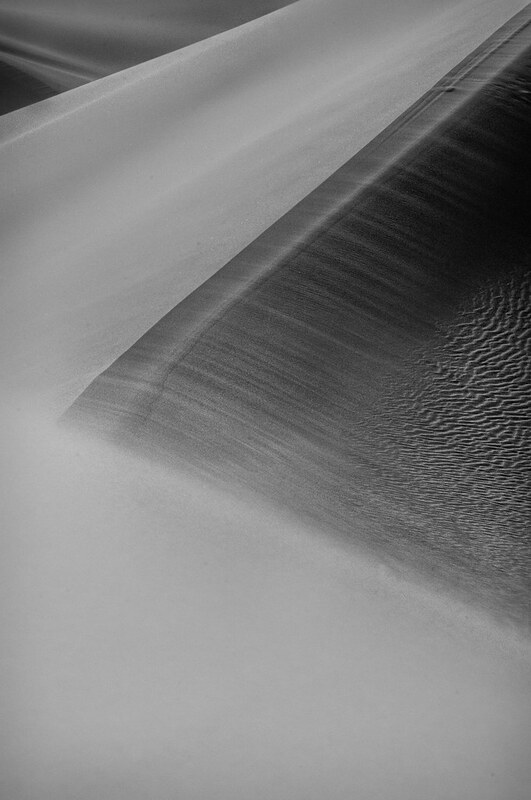 About the photos: These images are of the Eureka Dunes. Located in the remote northwest corner of Death Valley National Park, these are the tallest Sand Dunes in North America. When the wind blows, which in the desolate Eureke Valley is almost all the time, and if the sand dunes aren’t too wet, the dunes reach a harmonic. It is as if they were playing a tune. Wandering the crest of the Eureka Dunes at twilight a few weeks ago listening to the music of the sand I shot these images, trying (with only partial success) to keep the sand out of my gear. It is quite a shuffle to get the tripod off one’s backpack and the camera out, protecting both and the gear bag from the blowing sand. My thought with these images was always monochromatic, and I intentionally created images that used noise to seem a bit gritty. Gritty, but beautiful—like the dunes themselves! Ladyboot Arch, photo by Harold Davis. View this image larger. This is an image of Ladyboot Arch, named for perhaps obvious reasons, shot in the Alabama Hills on the last night of the recent Star Circle Academy workshop. Facing the snow-covered crest of the Sierra Nevada Mountains, seen through the arch, on a chill November night, I wanted to make an image that showed details in the arch, the sky, and the distant mountain range. With bright moonlight coming from the left of the camera, but parts of the arch deep in shadow I knew that some pretty fancy footwork beyond star stacking would be needed to capture the extended dynamic range of the scene. 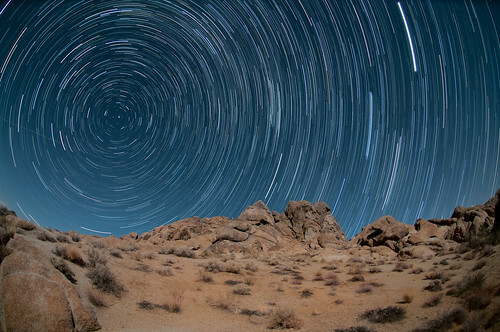 To learn more about night photography, check out the night category on my blog and the Star Circle Academy blog. If you are interested in star stacking, you may find the Stacker’s Checklist particularly helpful. The subtext here is that “stackers” are definitely not “slackers”. All exposures 12mm, tripod mounted; background (star trails) forty-two one minute exposures at f/4 and ISO 200, combined using stacking; foreground (arch) three exposures (90 seconds at f/14 and ISO 200, 211 seconds at f/14 and ISO 200, and 390 seconds at f/8 and ISO 640) combined to HDR using Nik HDR Efex Pro; foreground and background combined in Photoshop using layers, masking, and the Paintbrush tool. Arc of the Blue Sky, photo by Harold Davis. View this image larger. On the day before the Star Circle Academy workshop began I shot with some friends and early workshop arrivals in the Alabama Hills. It was a clear night, but the wind was brisk. After I found a sheltered spot I was able to shoot a sequence with no problems. This image is from a position very close to that of where I shot from in Alabama Hills Star Trails, but looking up and north rather than out and south. To make this image I used my 10.5mm digital fisheye and used my intervalometer to shoot 45 exposures at 90 seconds each (aggregate exposure time a bit over an hour). Each exposure was made at f/3.5 and ISO 400. I stacked the exposures together using the extended version of Photoshop’s Statistics script, with the stack mode set to Maximum. The moon light was bright enough that I didn’t have to worry about light painting the foreground (or shooting a longer exposure for the foreground). 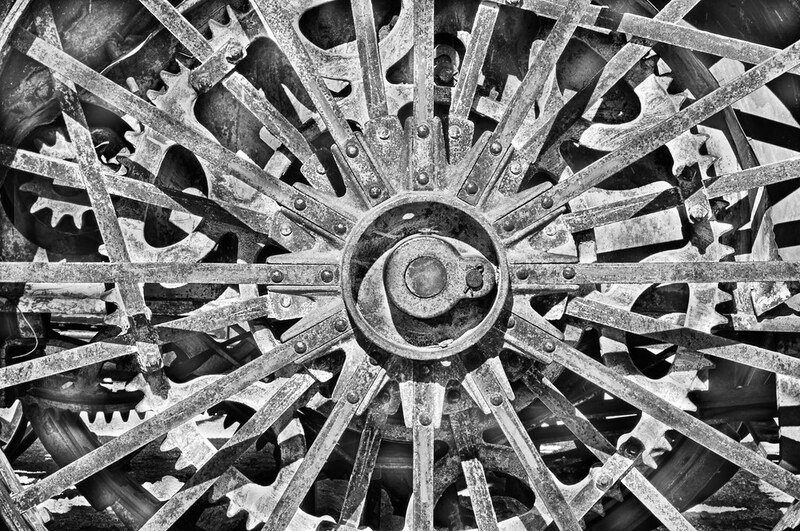 This wheel of the thresher shown in Separating the Wheat from the Chaff called out to me because of the tonal contrast between its inner workings and outer structure. I shot for HDR using my 105mm macro lens on a tripod, making seven exposures at shutter speeds from 1/320 of a second to 4/5 of a second. Each exposure was at f/32 and ISO 200. There was strong and rather harsh frontal lighting on the wheel, so one of the points of shooting for HDR was to subdue this harshness to avoid an overly washed-out look. I processed the image in Nik HDR Efex Pro, starting with the custom preset that I explained in HDR is Technique, not Style, and also using some hand-HDR layering in Photoshop. With an image that is essentially monochromatic even though there are some colors—as is the case here—I tend to “go with the flow” and explicitly present the final image in black & white. To do my monochromatic conversion, I used a number of Nik Silver Efex 2 presets along with an explicitly monochromatic HDR version created using Photoshop’s Merge to HDR Pro. On a balmy autumn night in early November I treated myself to a good dinner at the Yosemite Lodge restaurant. Then I headed out into the Yosemite Valley night with my camera, tripod, and intervalometer. This image was made from the Swinging Bridge, facing back towards Yosemite Falls and Yosemite Village. I combined different exposures for the foreground and for the stars. 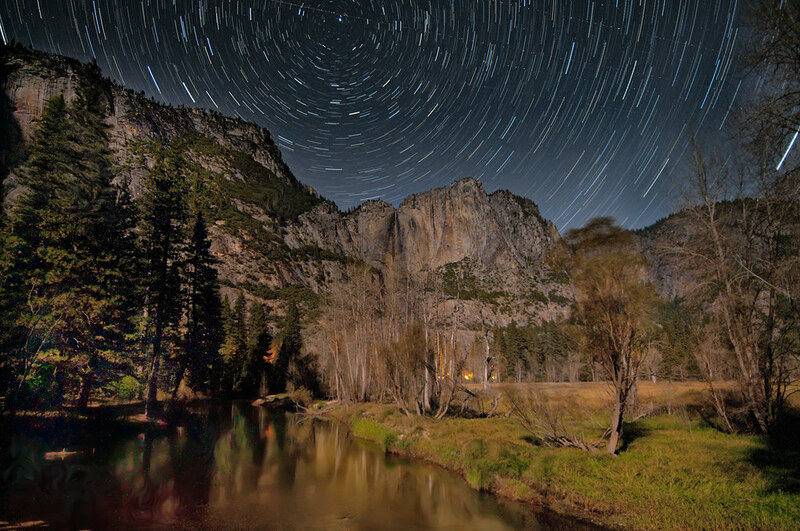 Yosemite Valley was lit by moonlight, which helped make the foreground exposures possible. The landscape in the foreground was made from an HDR blend of three exposures, shot at roughly one minute, two minutes, and eight minutes. 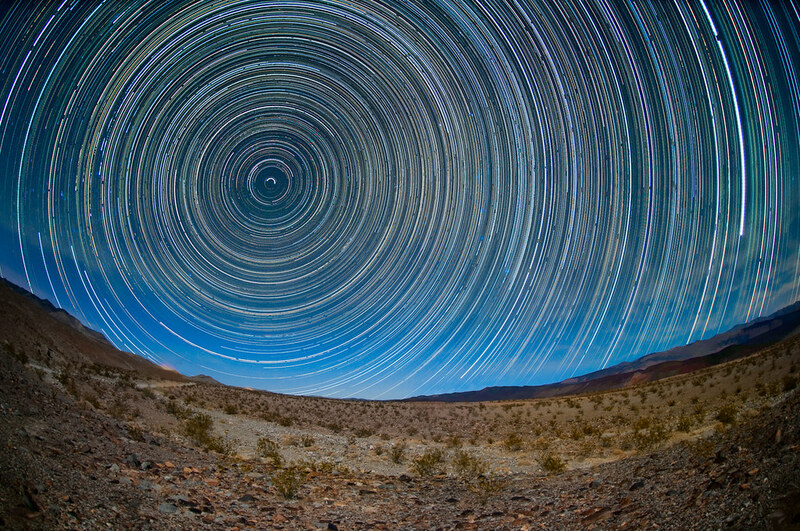 The star trails in the sky were created from 21 exposures shot at one minute, and then stacked. I combined foreground and background in Photoshop using a layer mask and the Gradient Tool. All exposures were at 15mm, f/4 and ISO 320. It’s striking to me that the moonlit landscape in the foreground has as great a dynamic range as daylight shots. Looking at the eight minute exposure, bright areas like the cliffs and meadows that the moon lit touches are bright. But the shadows below the trees along the Merced River are still deep and inky in their blackness. This is an image of a thresher, a machine used in farming. A threshing machine separates grains from stalks and husks, or—as the saying goes—separates the wheat from the chaff. 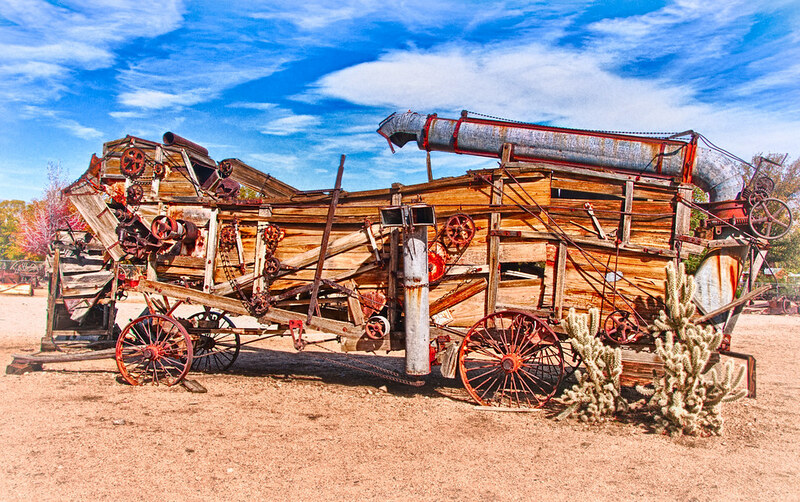 This particular thresher dates from the early twentieth century and is sitting in the yard of the Eastern Sierra Museum in Independence, California in Owens Valley. I created the image by blending four exposures to make an HDR composite. Exposure data: 22mm, four exposures at shutter speeds from 1/2000 of a second to 1/80 of a second, each exposure at f/11 and ISO 200, tripod mounted, exposures combined using Nik HDR Efex Pro and hand layering in Photoshop. To make this image, first I needed one wet spider web with a colorful background. 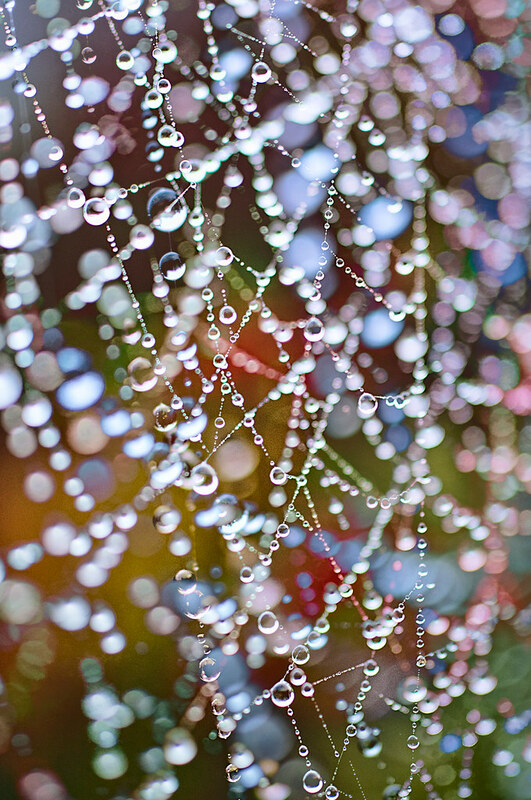 The web I found is shown in a somewhat more conventional image in Wet Web. It was early in the morning, and the low-angled sun was adding saturated color to the scene. I switched to my 50mm macro lens and used Manual exposure controls to open the aperture all the way to f/2.8. Next, I dialed up the shutter speed so that it was fast enough (1/500 of a second) so that the motion of the spider web in the wind wouldn’t have much impact. Up close and personal, I shot a series of “portraits” of individual waterdrops, with the idea of keeping one or two drops in focus but letting the background go out of focus so I could capture attractive bokeh in the frames. Back at the computer, I combined the images using stacking—so that the brightest drops were the ones that appeared in the final Photoshop composite. 50mm macro, twenty exposures, each exposure shot for a duration of 1/500 of a second at f/2.8 and ISO 200, hend held; exposures combined in Photoshop Extended version using the Statistics script with mode set to Maximum. Sea Palm Forest is another image of mine created unconventionally with stacking. 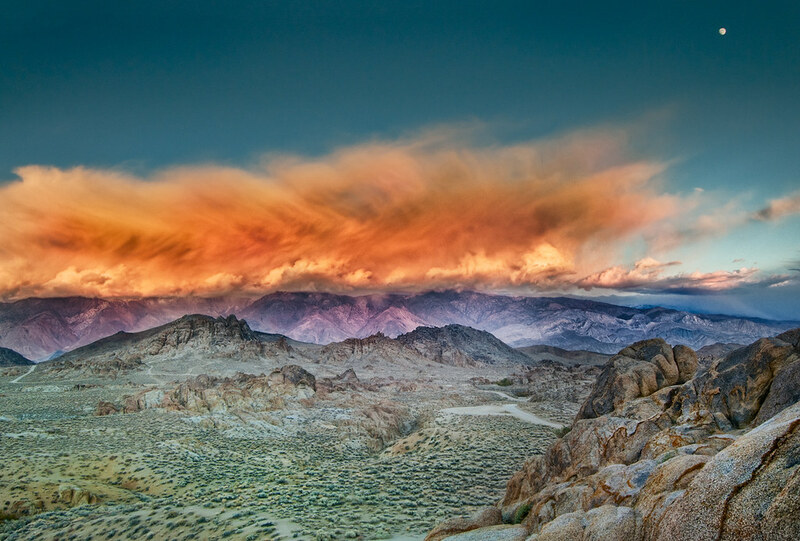 This is a sequence of four capures made looking east from the Alabama Hills towards the Panamint Range and Death Valley, combined into a single HDR shot. Exposure data: 17mm, four exposures at shutter speeds from 1/60 of a second to 1/640 of a second, each exposure at f/8 and ISO 200, tripod mounted; exposures combined to HDR using Nik HDR Efex Pro and hand layering in Photoshop. 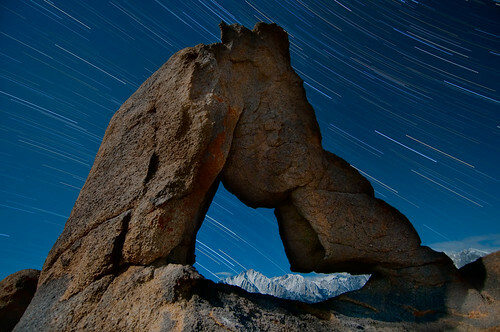 Some related stories: Alabama Hills Sunrise; Double Double; Crossroads of the Cowboy Universe. About fifty miles down the desolate Saline Valley road, one valley to the west of Death Valley, as the sun set, I stopped to camp for the night. I set up my camera with an external power supply, turned it to face roughly north, and let it rip while I slept. There are 306 two-minute exposures in this sequence, for an elapsed exposure time of about ten hours. I started at 6PM and turned the camera off at 4:18AM, when cloud cover obscured the northern sky. Processing the 306 exposures was more of an ordeal than shooting them. I ran them in a single stack using the Photoshop Statistic script—and after about three elapsed hours it crashed Photoshop. Clearing some space off my working hard drive helped, as did running the stack divided in three—with the pieces combined into a single image. Exposure data: 10.5mm fisheye, 306 exposures, each exposure at two minutes, f/2.8, and ISO 320, exposures stacked using Photoshop Statistics set to Maximum; tripod mounted. For more about the technique I used in this image, see Stacking Star Trails and (for night photography techniques in general) the night category on my blog and the Star Circle Academy blog. At the end of a remote valley in the northwest corner of Death Valley you’ll find the Eureka Dunes. At close to 700 feet tall, these are probably the tallest dunes in the United States. In the late afternoon I climbed to the top of the dunes, my camera and tripod strapped to my back. The wind blew intermittently. When it gusted it was so strong as to penetrate clothing and camera bag. Looking down I saw sand gusting across the top of a lower sand dune, creating patterns of light versus dark, and blown sand opposed to still sand. Meanwhile, Eureka Dunes sang. In the wind, these dunes gave off vibrational harmonics—an oddly inspiring series of musical notes, played alone to the distant desert valley, me and a void of wind. Exposure data: 200mm, 1/640 of a second and f/25 at ISO 320, tripod mounted.